ECOMIX C reduces hardness, iron, manganese and tannins. Install it in a single tank. It operates just like a softener. Why install two tanks when one could work? * Use ECOMIX C in a water softener to save space and solve multiple water treatment problems. Simply load and regenerate the Ecomix, then operate the system like a water softener. 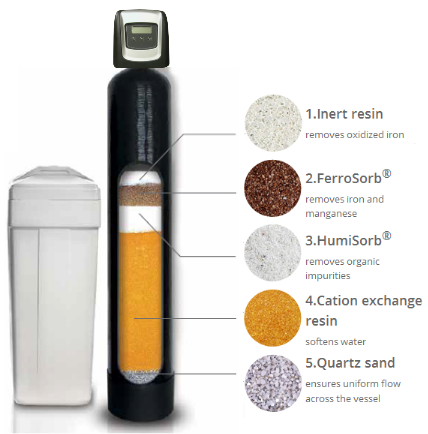 Once regenerated with plain water softener salt it self-classifies into 5 layers. It includes two unique medias. The inert layer and Ferrosorb® layers reduce soluble iron (ferrous, organic & colloidal) and manganese by adsorption and oxidation. The layer of HumiSorb® reduces natural organic matter (tannins or TOC). The cation resin softens the water and a quartz support bed ensures uniform flow across the vessel. The incoming pH of the treated water is NOT affected. Water Quality Limitations – Try the easy to use calculator! Service flow rate – 8-10 gpm per sq. ft.
Backwash/fast rinse – 4-6 gpm per sq. ft.
Regeneration -1.2 – 2 gpm per sq. ft.
*Treatment of tannins may not be a “one tank” solution. In tannin applications please contact ShedWater or your water professional to discuss options. In most cases we recommend post treatment with activated carbon to completely remove color bodies (or tannins) from well water. 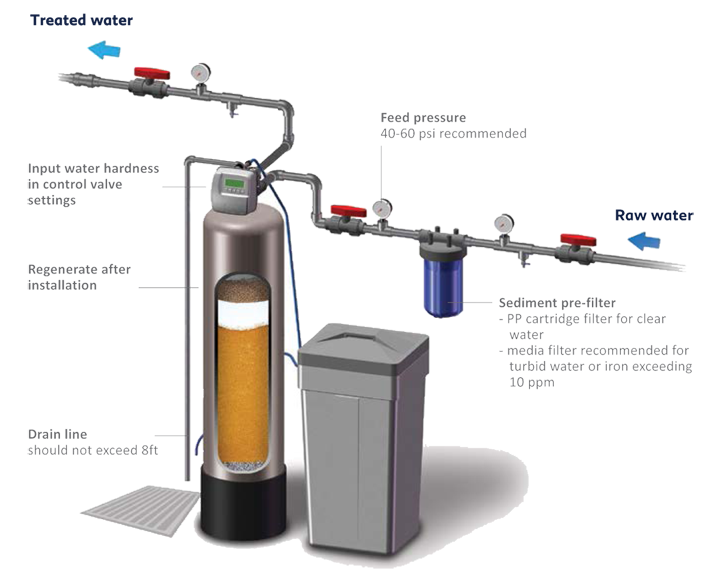 ECOMIX is certified in compliance with NSF/ANSI standards: 44-Residential Cation Exchange Softeners: 61-Drinking Water System Components-Health Effects; 372-Drinking Water System Components Lead Content. Water treatment professionals use ECOMIX filtration to treat potable water for residential, commercial and industrial applications. It was developed and patented in 1998 in Ukraine, is manufactured in Germany, and stocked in the US and Canada.